Here's a ready-made bunch of mummy characters, ready to play - or to use as a well-rounded set of NPCs, allies or adversaries as you please. 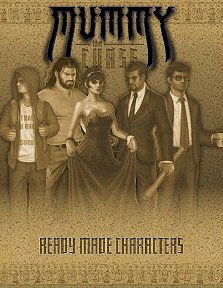 Publisher's blurb: "In these pages you'll find the five Arisen patrons of the Club Taboo, from Lady Isis, the mistress of masks, to Djehutimose, the club's undying bouncer, each with a detailed background and complete game statistics. "Five very different souls, one very unique meret of mummies."